The areas dredged are in red. Update, July 16: Information has been clarified about where the spoils were hauled after being dredged, and the earth that vanished is from town-owned property. The N.C. State Auditor’s Office has requested interviews with 11 current and former Manteo town officials as part of a recently opened investigation into the dredging of Dough’s Creek Canal last fall. 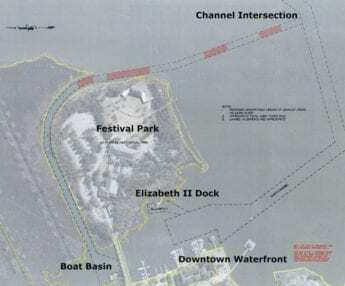 The canal runs around the north side of Roanoke Island Festival Park and was dug in the early 80s to maintain access to Roanoke Sound for property owners who were cut off by construction of the Cora Mae Basnight Bridge between downtown Manteo and what was once known as Ice Plant Island. The sand was barged to a lot near McDonald’s on U.S 64 in Manteo owned by Klimkiewicz Family Manteo I, LLC. While no buildings are located on the 331,100-square-foot parcel, a 450-foot-long canal from Shallowbag Bay with a bulkhead and boardwalk on one side runs down the middle. After initially being taken to the Kilmkiewicz site by barge, the spoils were hauled to the town’s wastewater treatment plant. But the earth that was dug out to create a pit for the spoils disappeared, with at least 70 truckloads hauled away by unmarked vehicles according to surveillance video. The nearly $649,000 project was paid for with appropriations in the state budget from the Shallow Draft Navigation Channel Dredging and Aquatic Weed Fund and money held by the now-dissolved Roanoke Island Commission. An additional $88,000 came from a grant obtained by Manteo to cover unexpected expenses incurred by the town. Robert Olman and Kevin Thomas from the Auditor’s Office will conduct the interviews between Monday and Wednesday with Town Manager Kermit Skinner, current Mayor Bobby Owens, Jr., former mayors John Wilson and Jamie Daniels, town commissioners Darrel Collins, Richie Burke, Eddie Mann, Hannon Fry, Nancy Peele and Christine Walker, and Town Clerk Becky Breiholz. “Mr. Olman has requested information regarding the lease of the Klimkiewicz property that was used as the barge landing site for the dredging project,” said Shannon Twiddy, assistant Town Manager and Finance Director, in a July 10 email. “Staff researched the files at the Town Hall and were not able to find an executed lease,” Twiddy said. “I advised Mr. Olman I did not have a signed lease and I reached out to Quible and Associates as they were hired for project management to ask if they could provide a copy of the lease to Mr. Olman,” Twiddy said. Warren Eadus with Quible and Associates responded to Olman’s request the same day. “The Klimkiewicz family does not live in the area and their local representative, Lee Tugwell was approached to find out if the property could be used,” Eadus said. “I believe we were told verbally heading into the new CAMA Major Permit process in the spring of 2016 that we would be allowed to use the property, but we didn’t iron out any details until later in the permit process,” Eadus said. “I do not know if there were any additional talks between the Town and the Klimkiewicz’s representative after that meeting but we walked away with a verbal agreement and moved forward with the project,” Eadus said. Town commissioners have held a pair of closed sessions since March to discuss the matter of the missing sand, but details of those proceedings are protected under state statutes. An anonymous letter from someone claiming to be a “whistleblower” sent to several state agencies, including the State Auditor’s Office, may have spurred the investigation. The letter makes accusations that local CAMA officials granted the permit in collusion with the town, some current and former town leaders may have personally benefited from the dredging of the canal, and that the sale of the sand was inappropriate. The town is now trying to recoup money from dredging contractor Carolina Marine Structures for the lost dirt as a civil matter after consulting with the District Attorney’s Office. Maintain our water ways. They never finished as the entrance to manteo waterfront is dangerous. Maintain it fix it now nc. Who cares where the sand went if someone benefits from it its because they let them dump it for free probably. Now when there done counting the beans. Finish your job and maintain the channel like they need to do in all the shallow areas in the navision channels. How much does this audit cost? @sean ‘who cares where the sand went’ I’d say all the taxpayers in NC care. Bet money that sand wasn’t given away and why wasn’t it just taken to the Manteo lot? People like you are what’s wrong with the world, you don’t care how many rules are broken or how many people may waste others money as long as you get what you’re after. I have to agree, in part, with Sean – who cares where the useless-to-anyone sand spoils went! It makes no difference, nor does it effect how or why the dredging was not complete. Complete the dredging project for the shallows, and move on. It appears there was an agreement to use private land to dump the useless spoils – for free, likely – in exchange that land owner can take and use the sand as they see fit! Sounds like a win – win for everyone. Not everything is a big conspiracy and not everything needs to spied and combed over (using MORE town money, by the way) to prove of disprove where useless sand went! Who Cares! Dredge the rest of the channel, you know, the important part! Let it go and move on to more important things – like minding your business! Good Ole Boy network alive and well wasting our tax dollars. If laws were broken lock all involved up. The dirt I work on is spoils that were put on the property FOR FREE. so no one ( state or town) had to pay to haul and dispose of the spoils. Why doesn’t the District Attorney do anything ? Is he being paid off or is he just another good ole boy? Lots of fingerprints on that cookie jar! If you folks that “don’t care” what happened to the fill then you don’t care about stealing? It not “unuseful material” at all. Either you’re in with someone on this or you really don’t know about things. No paperwork, unmarked trucks hauling it away, yeah nothing to see here! Better believe that it was crooked and believe me, State Audito Bev Wood doesn’t play politics nor will she be bought off! If she is on it someone better fess up and quick! With the building of the Cora Mae Basnight Bridge to provide access in 1984 to Festival Park, boating access for the residence of Dough’s Creek was cut off. With this stated, the State of North Carolina entered into an agreement to dig and maintain the subject canal. With this stated the State has never performed any maintenance dredging since it was originally excavated. When townspeople approached the State to do the dredging, the State pleaded lack of funds and put the dredging on the Town of Manteo, Festival Park and other state grant funds. With this stated, the State needs to audit themselves and learn why they failed to uphold their agreement. If the State had done their job, the story would be different. Laws are broken on a regular basis when is comes to what is misnamed as developers. Just look at what happened at Pirates Cove, the entire sub-division was/is illegal. Look at what Saga Destruction has planned too. @Bud. I challenge you to cite a specific rule that was broken at Pirates Cove regarding the development of both the community and the marina. It is easy to spout off as you have, but cite a specific rule that was broken. You must have a list of rules for you have claimed the ‘entire subdivision was/is illegal’. Development of the property commenced pre-CAMA, and local, state, and federal permits were received thereafter. If you understood the permitting review of the development, you would understand that it complies with all regulations. The sand material dig out for the pit was meant to go to the treatment plant, but It didn’t, It was taken and used or sold somewhere else. It didn’t belong to the person who took it. It was meant to be used elsewhere and did/does have a monetary value. 70 loads, that they know of. Someone has to be held responsible. These contracts have specific outlines for a reason. @obx resident perhaps Bud is making reference to the destruction of the marshland where this development took place. I had a duck blind, in my youth, where Spinnaker Village is now located. Must have taken a lot of $$$ to cover all that with spoil, and no off setting mitigation? I also watched the piling being driven for the first buildings constructed, and it was eye opening! Those piles fell in 15-20’ on the first hit from piledriver. Anyone telling that secret to current and future owners? It is built on pudding!